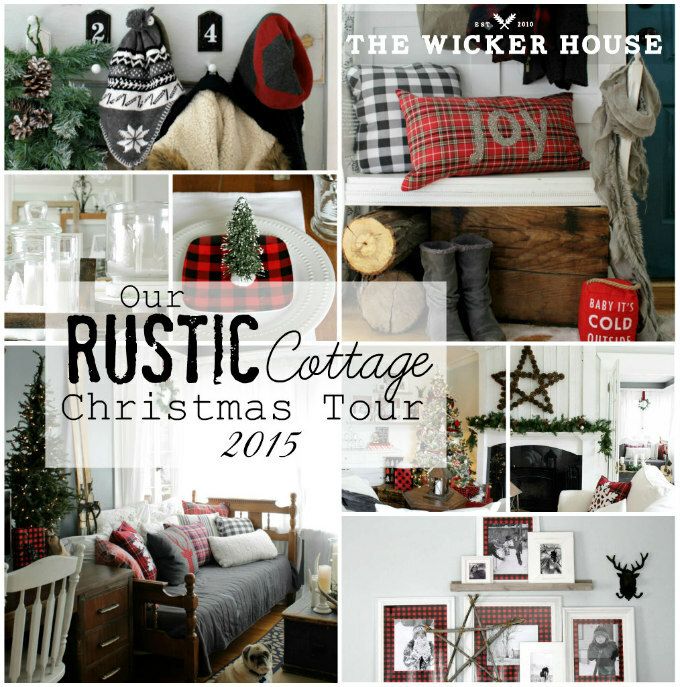 Hello and Welcome to our Rustic Cottage Christmas Tour! Every year I look forward to seeing how everybody has decorated their homes for Christmas. 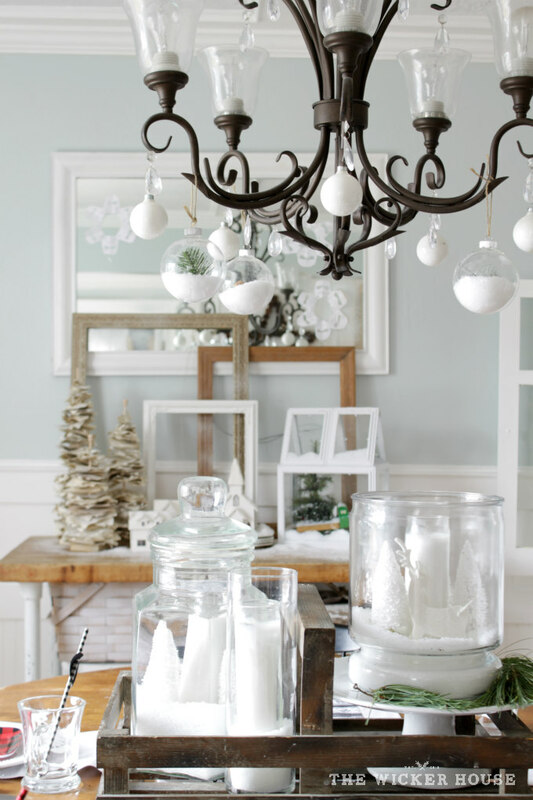 There is so much lovely inspiration going on right now, that I'm already thinking about how to decorate for Christmas next year. 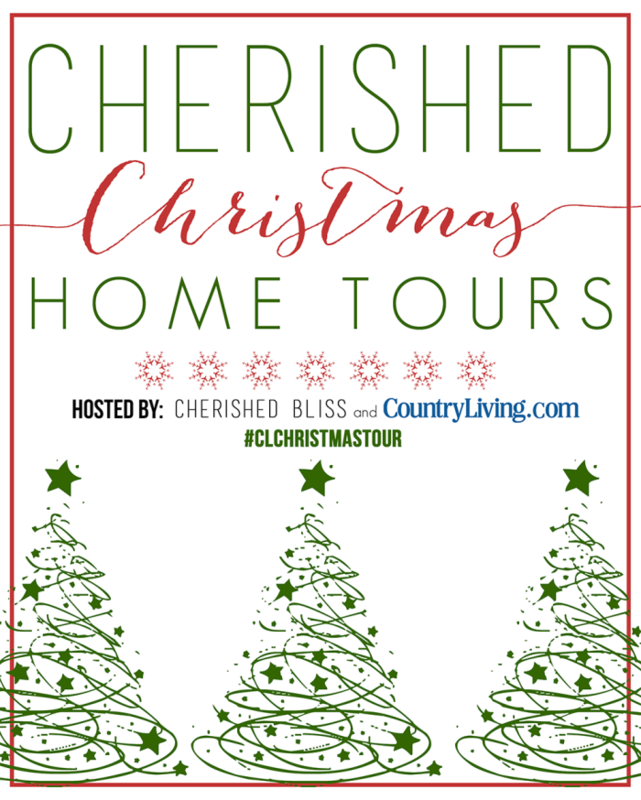 This is my very first time participating in a Christmas home blog tour. I've always wanted to do this, so I want to give Ashley from Cherished Bliss a huge Thank You for inviting me, it's a dream come true. And to have the tour also hosted by Country Living tops it all off. So with all that said, I may have gone a little overboard and decorated our home way more than I ever have in the past. I also took way more pictures than I could possibly share. But no worries, I've narrowed my pictures down to just my favorites and then you can return later for more pictures, projects, and details to come. So let's get started! You are probably coming over from Stone Gable, Isn't she great! She is a favorite of mine. But if you are just tuning in, you can start the tour from the very beginning by heading over to Cherished Bliss HERE. Welcome to our 1924 cottage home! It's cold out here in Idaho, so hurry and come on in! 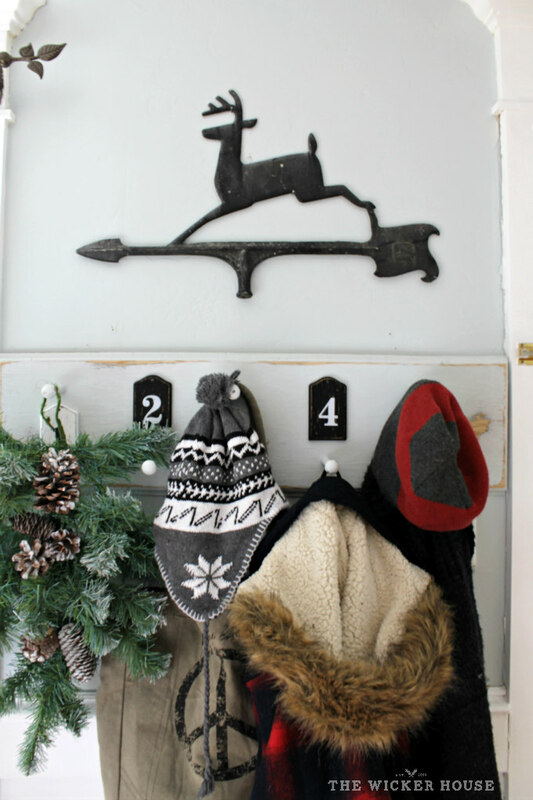 Next to the door are a few hooks to hang up your hats and scarves. And a bench to sit down and kick off your boots. I received the adorable red door stopper with rope handle from Pavilion Gift. Pavilion Gift has them on sale right now for only 9 dollars. They come in several different sayings and colors. And just a side note, if you're looking for a unique and special gift, Pavilion Gift is a great place to look. So when you first walk into our home you are greeted into our open living/dining area. A set of french doors lead you into our home office, which I like to refer to as 'the sunroom' because of all the windows. 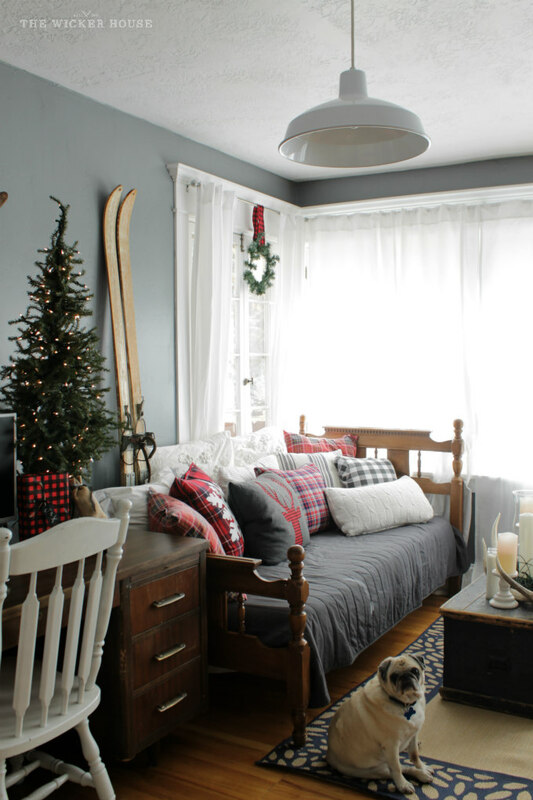 I recently painted this room a dark gray (post seen here) and honestly I did it especially for Christmas. 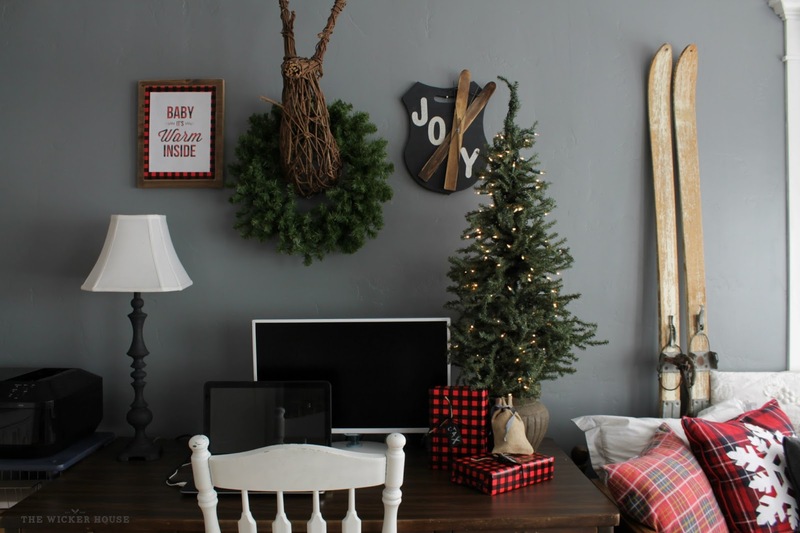 I wanted the room to feel warm and cozy, with a rustic, lodge, man-cave look to it, which I think is great for this time of year. 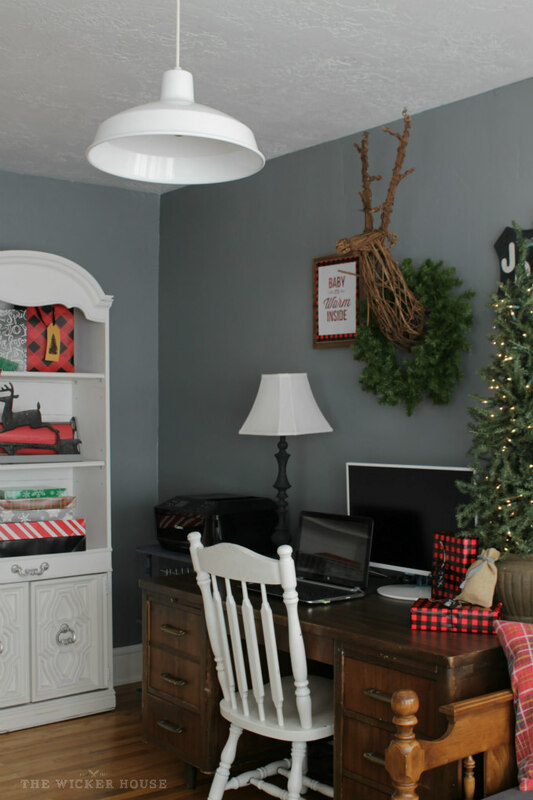 Above the desk is a wicker deer that I found at a thrift store last year. I just hung a wreath around it's neck. 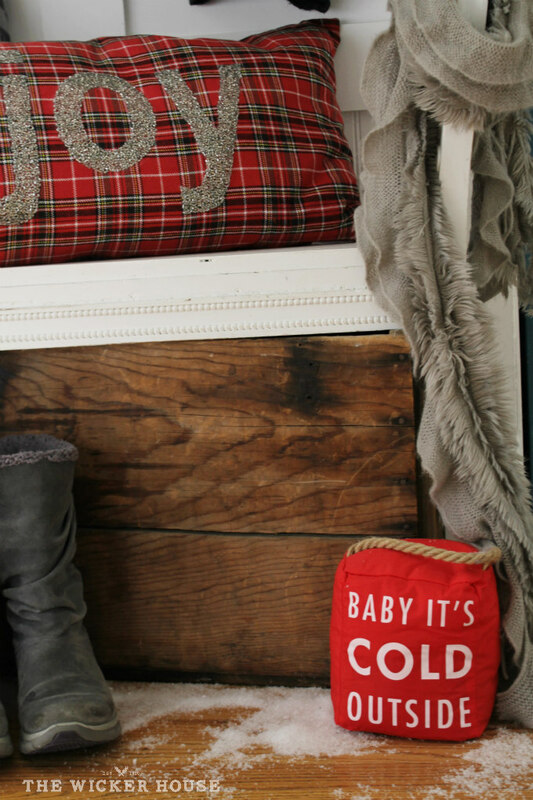 The cute 'baby it's warm inside' was a free printable I got HERE from Yellow Bliss Road. (Thanks Kristin) And I made the 'Joy' sign, which can be seen HERE. Next to the desk are some white shelves that I have turned into a gift wrapping station. 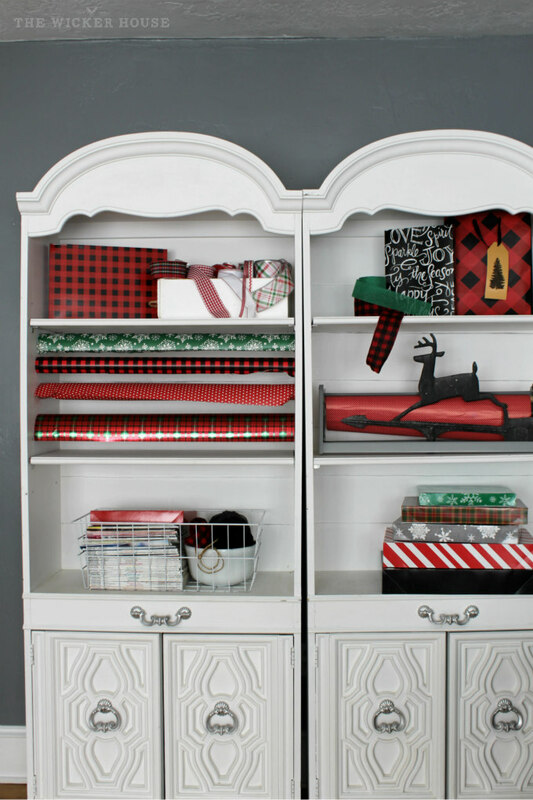 I love the idea of having everything I need to wrap my gifts all organized in one spot. 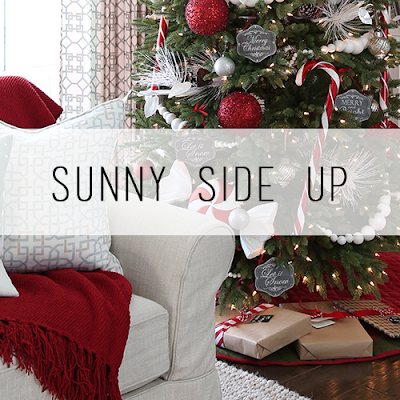 This daybed is always a comfy spot to lounge, especially with all of the pillows I pile onto it. Isn't that right, Abby? My sweet pug say's Hi! 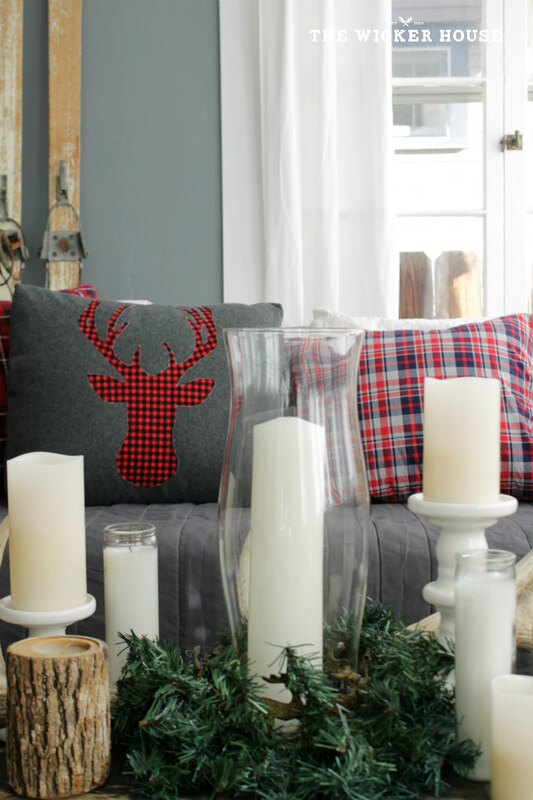 The plaid deer silhouette pillow is new this year. I made it out of a fleece dog blanket that I picked up in the dollar bins at Target. 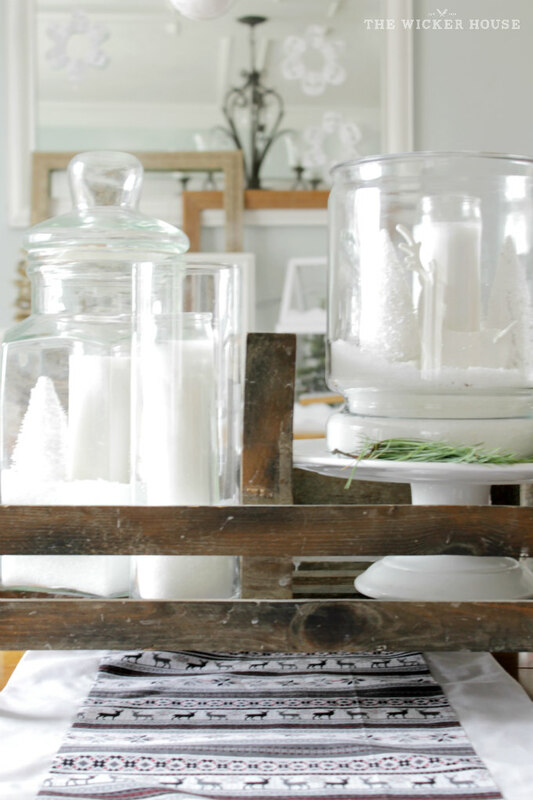 I shared a how-to HERE at City Farmhouse. And the vintage ski's were my grandmas, which I pull out every Christmas to remind me of her. Okay lets move back into the living room. For the mantel this year, I have displayed a large pinecone star that I made. A tutorial on how I made the pinecone star can be found HERE at Ella Claire. 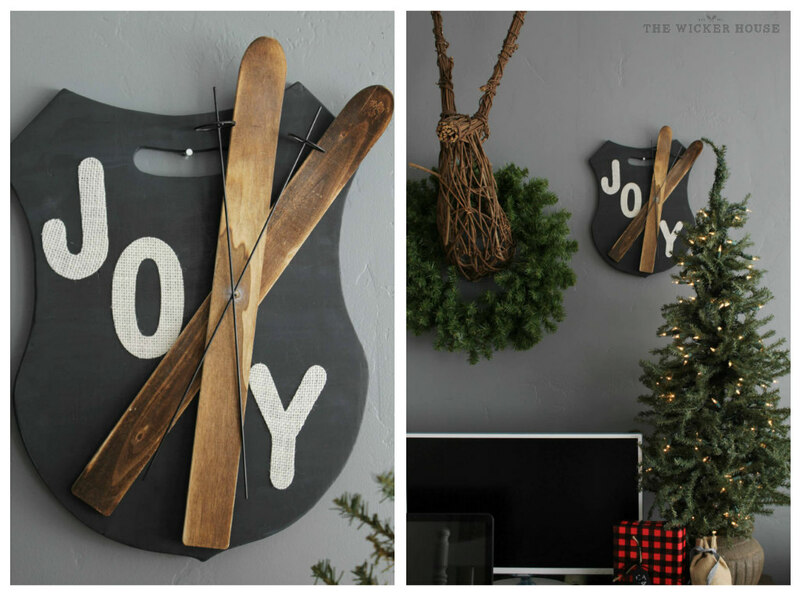 I think my favorite part of my holiday decorating is this gallery wall I have created. 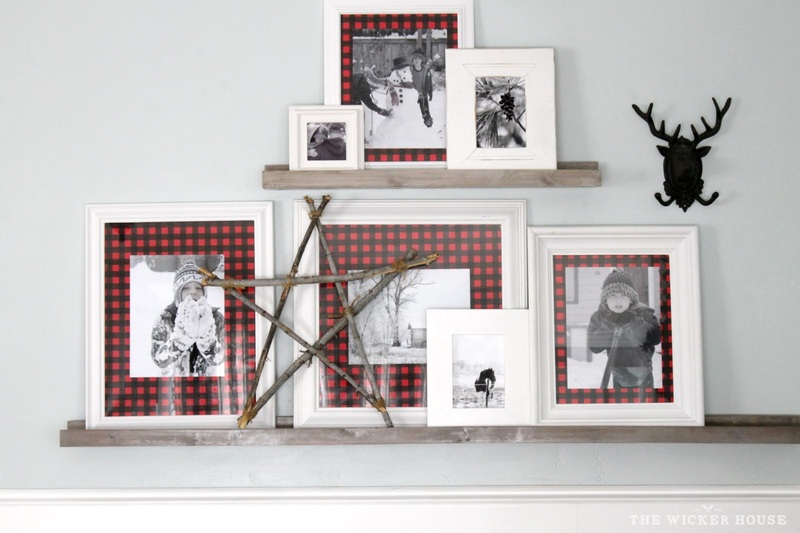 I used black and red plaid wrapping paper as photo mats and then I printed out some of my favorite winter pictures from last year. The pictures of my boys playing in the snow are dear to me because they remind me of our fun snow days together. In case you are interested, a tutorial for my DIY gallery wall picture ledges can be found HERE. They sure are a great way to display my pictures since I tend to switch them around often. I love my Christmas tree this year. 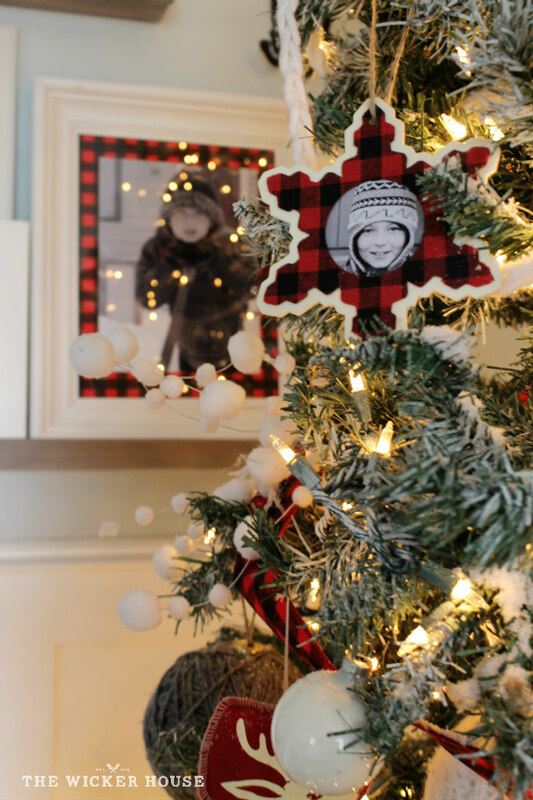 Most of the ornaments are from past Christmases, all except the red and black plaid ribbon I picked up at Craft warehouse, the black chalkboard balls that I painted (instructions coming soon) and these black and red snowflake picture frames from Target. 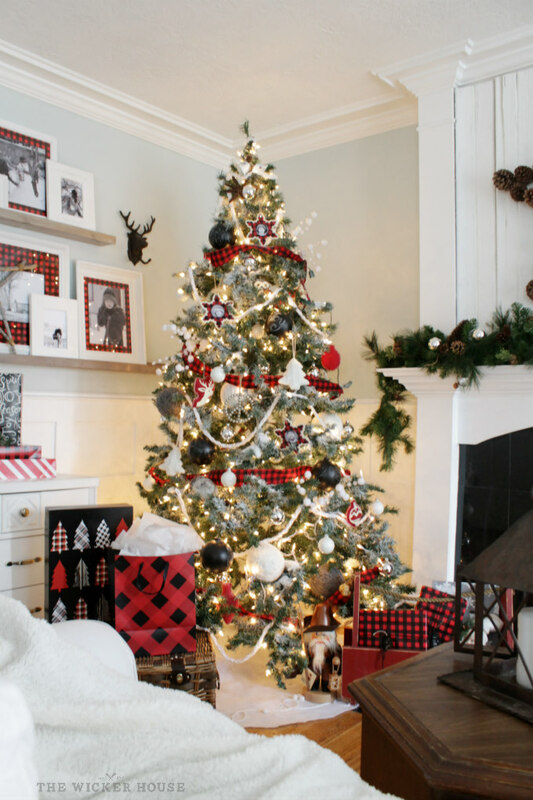 I had the idea of using black and red plaid in my holiday decorating, and Target really helped me out with that, I found all of the matching gift wrap, bags and boxes there. 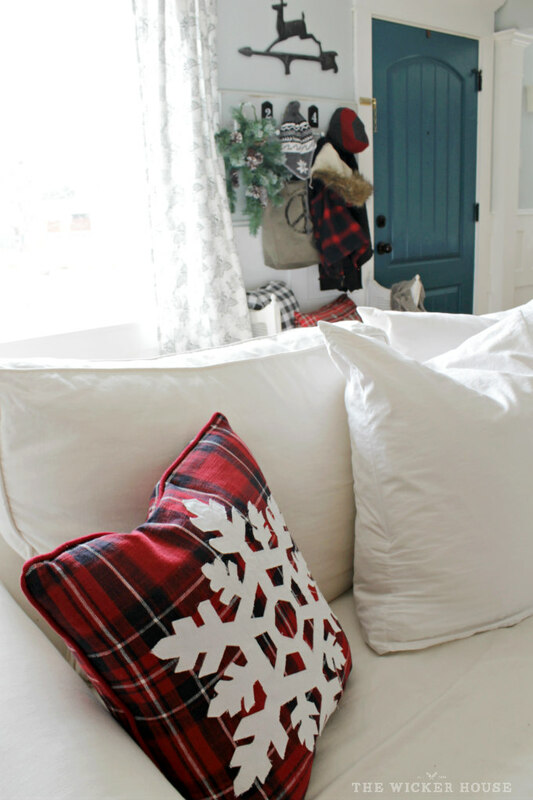 This plaid snowflake pillow is also new this year, I picked it up at Home Goods. 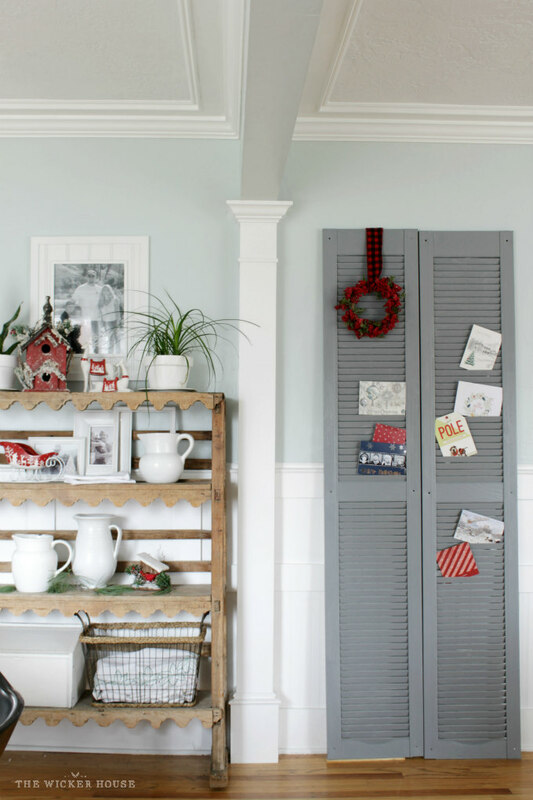 I brought down the old shutters that use to be in our master bedroom, I painted them the same gray as in the office, and then I decided that they would be perfect for displaying all of our Christmas cards this year. 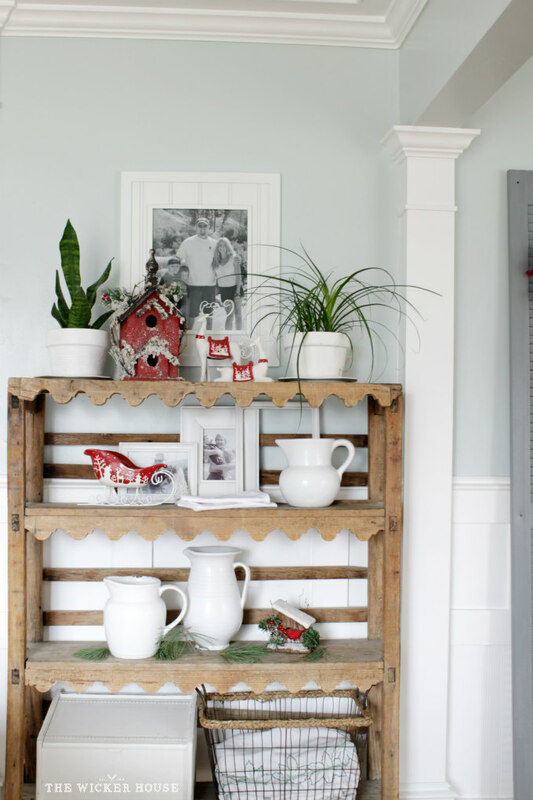 This antique shelf's styling stayed pretty simple, I just added a few pops of red decorations into the mix of white dishes. I really had fun playing around in here, giving it a snowy winter look. On the butcher block buffet table, I added some empty picture frames, a couple of book page trees and some little houses that were all made from previous years. Many of you are probably familiar with the mini green house terrarium that I made out of picture frames, right? Well if not, you can see instructions HERE. I'm happy to announce that even though I constructed this out of cheap picture frames, hot glue and duct tape, it is still standing strong. 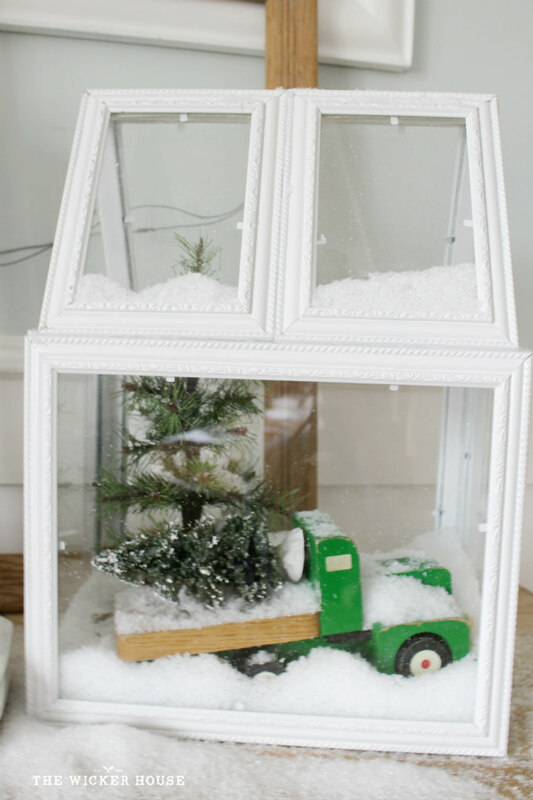 I placed my greenhouse on top of an old wooden toy truck and a small tree, and then I sprinkled in some fake snow. I just love it! 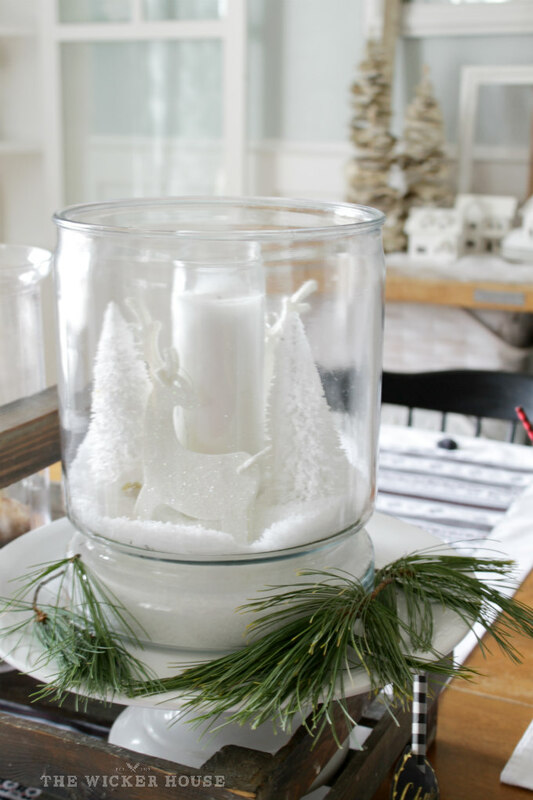 For the table's centerpiece I have filled large glass containers with white candles, white miniature trees, and more fake snow. They look like large snow globes with a magical winter wonderland going on inside of them. My Mother-in-law sewed the adorable table runner for me. 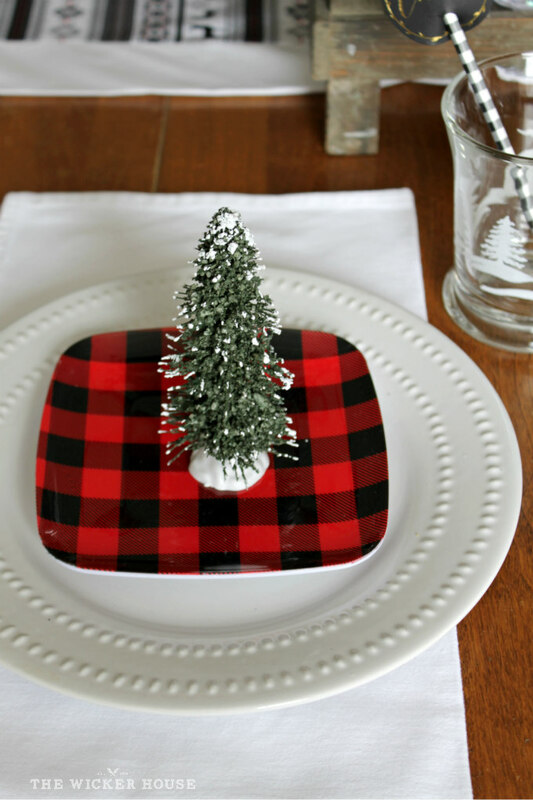 I added these attractive little side plates to my table to tie in the red and black plaid from across the room. I've also tied my silverware with red and black fabric scraps, keeping the look fun and casual. 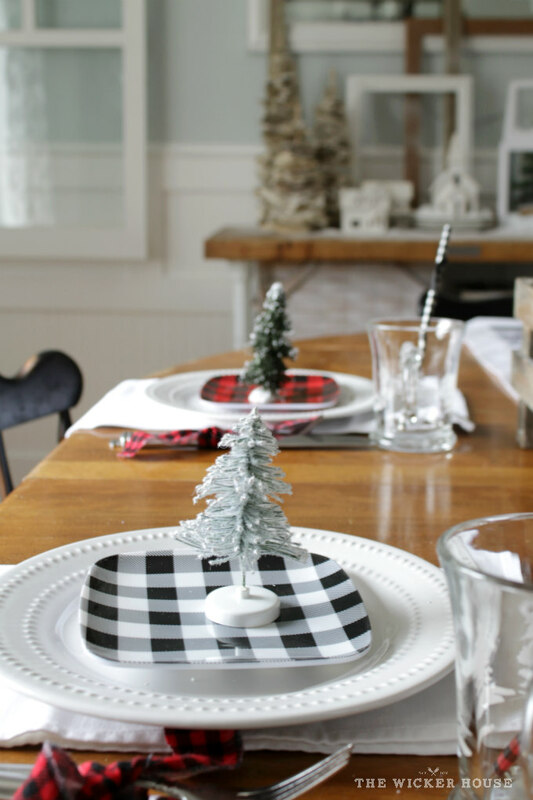 And I've added a little tree to each place setting just for fun. 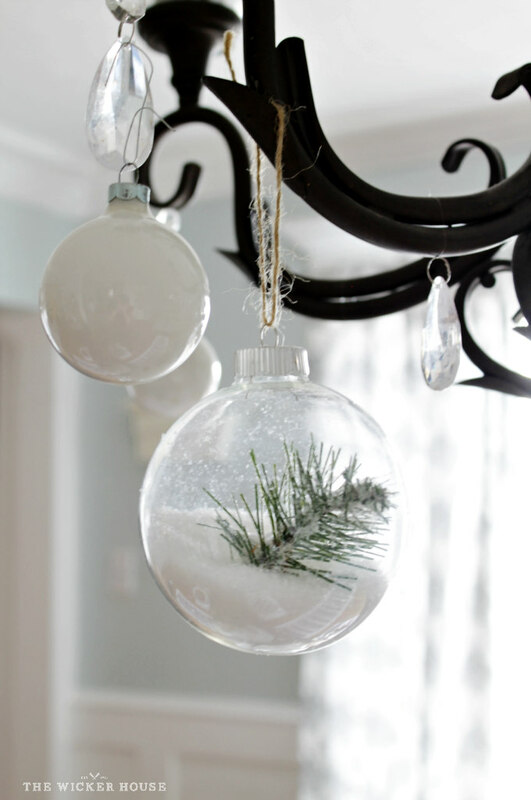 Hanging from the chandelier are glass ornaments that I filled up with more fake snow and a little tree branch. 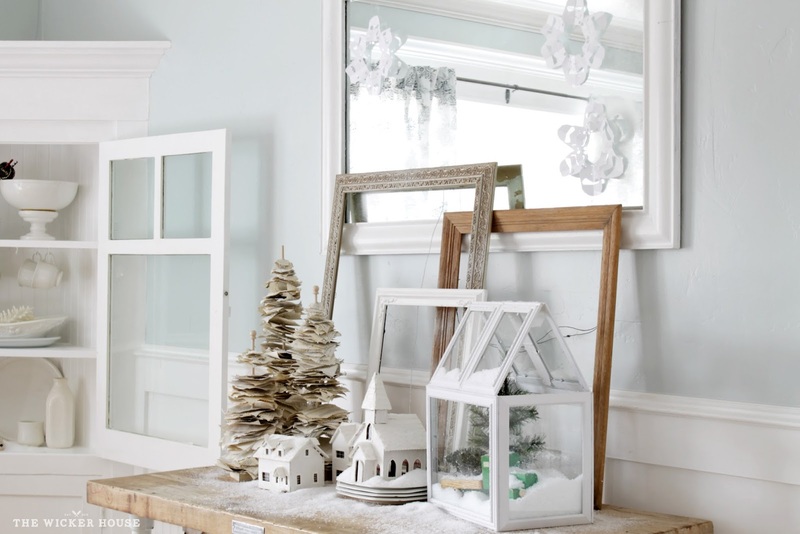 And there you go, our rustic cottage Christmas tour has come to an end. I'm really excited for this next stop, it's Sunny Side Up, Click on image to continue on the tour. 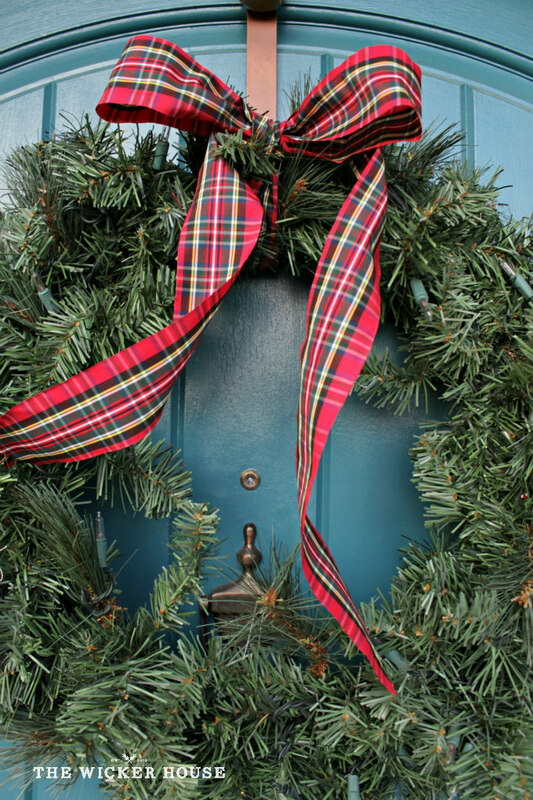 We would all love to see what your homes look like this holiday season. 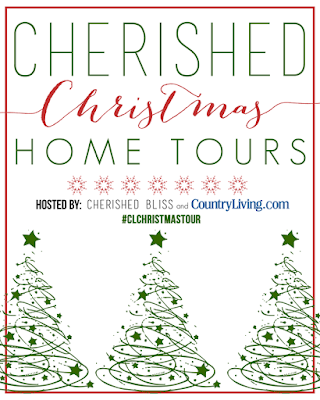 Please use the hashtag, #CLChristmasTour when sharing your decorating pictures on Instagram. 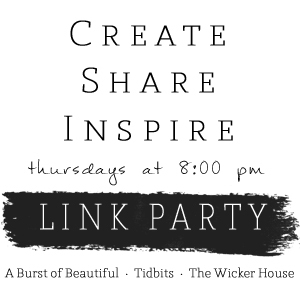 You may even be featured by one of the participating bloggers. P.S. 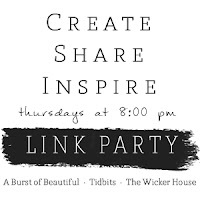 I also wanted to mention that every Thursday evening through Sunday, I co-host the Create - Share - Inspire link party. You should stop by and share what projects you have been working on. We'd love to see them. Love, love, love your Christmas tour!! There were so many great things, it's hard to decide which was my favorite!? 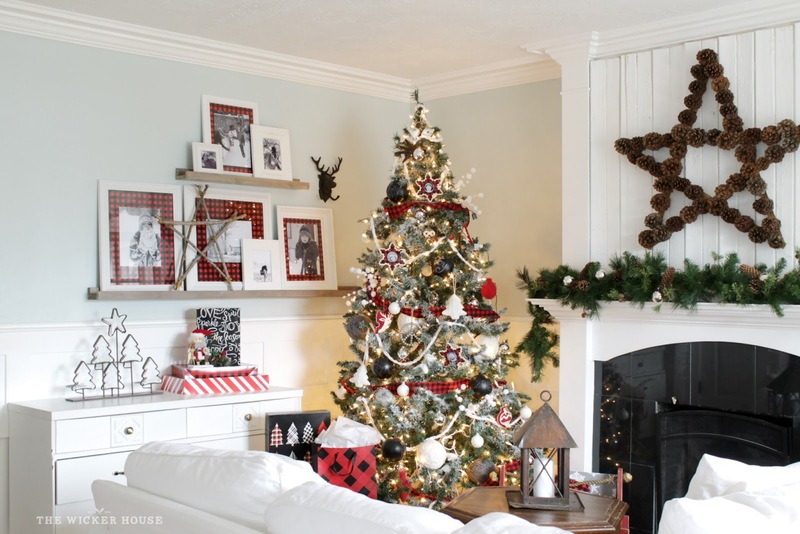 I love your tree and the pinecone star on your mantel!! Thanks for sharing so many wonderful ideas! Merry Christmas! 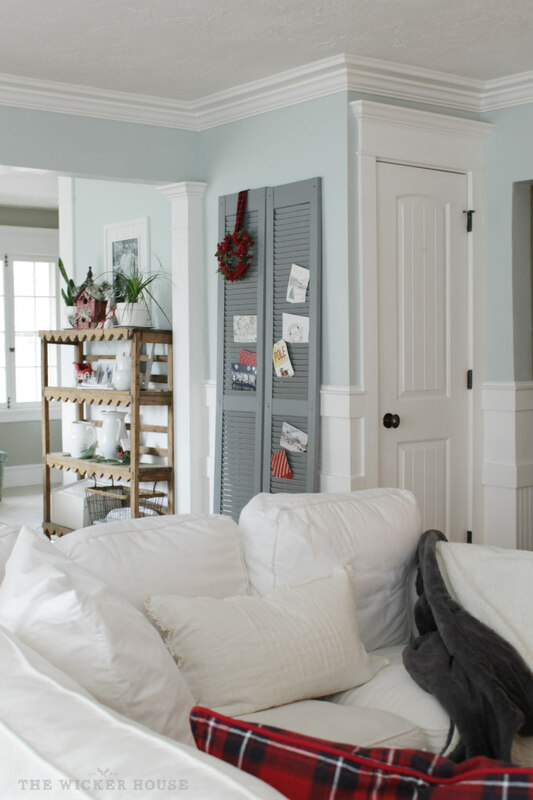 your home is always a favorite of mine- love those gray walls with the bed and the plaids... i just want to come curl up with my coffee and take all the christmas tours from that spot, ok? Wow! Your home is gorgeous. I really love your style. I also absolutely love the planter you have by your front door--where did you get it? 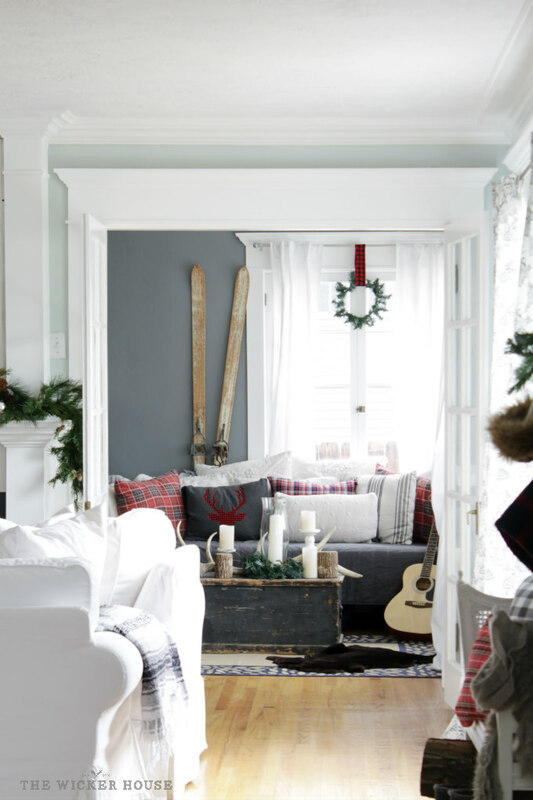 Everything is so lovely cozy and chic. Yours is the BEST tour I have visited this week! You tour was an absolute pleasure!! I enjoyed every, single photograph. Tickled to be touring with you! Your style is amazing! I love seeing what you've put together here. 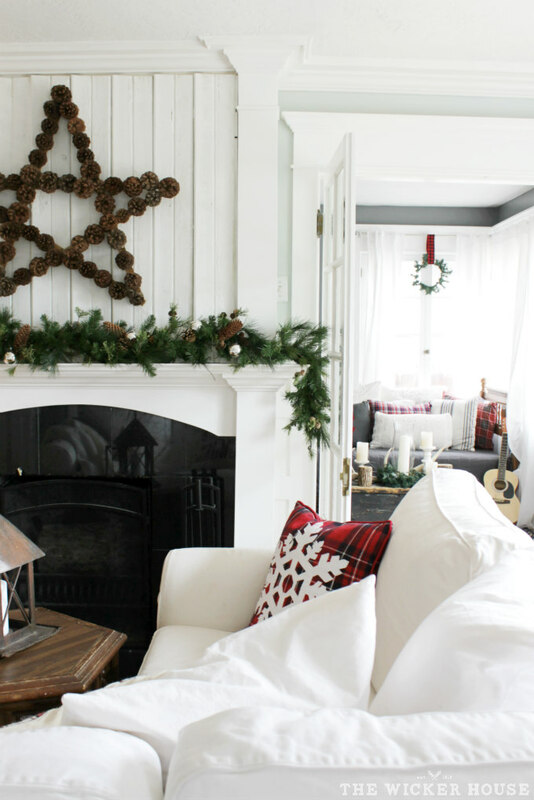 And I'm completely in love with the star pinecone wreath over your fireplace! Totally awesome! Every sweet detail! You are so talented and creative Emily! You did an amazing job Emily! 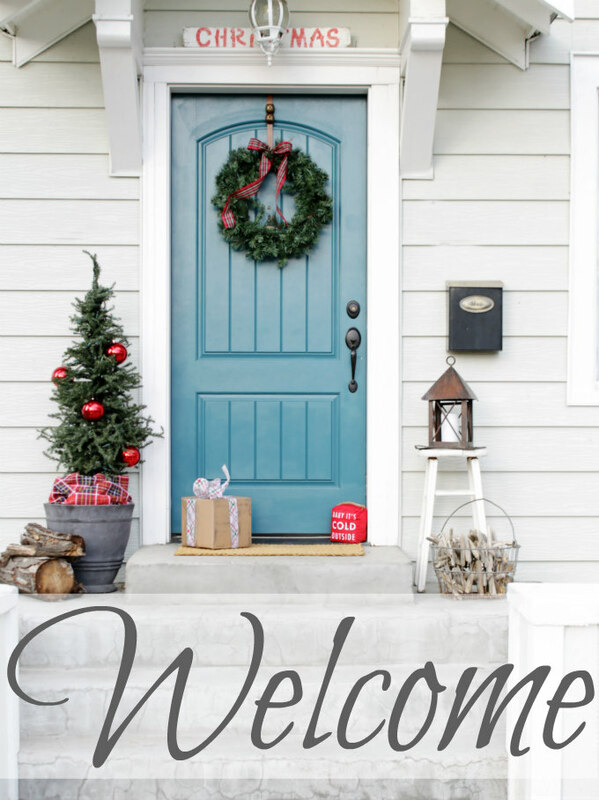 Your home looks wonderful! I just love your style! 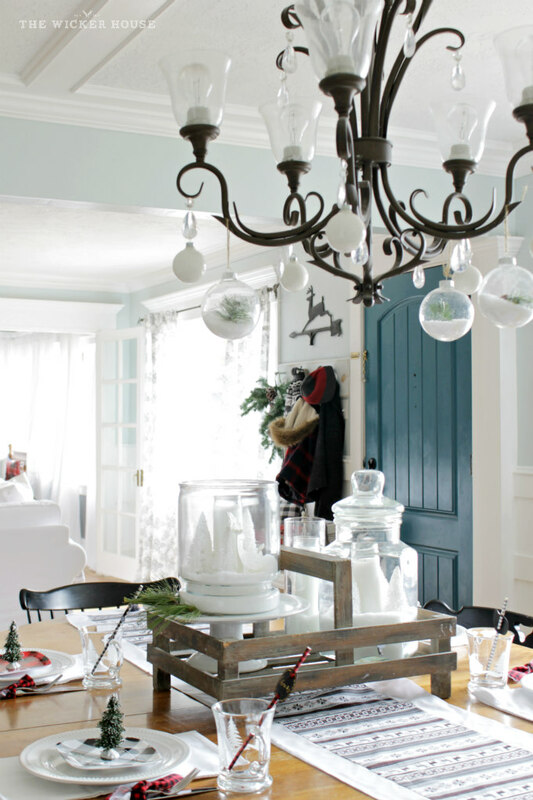 I know I am a bit biased towards you - but this has been my absolute favorite home tour yet! You rocked it girl! 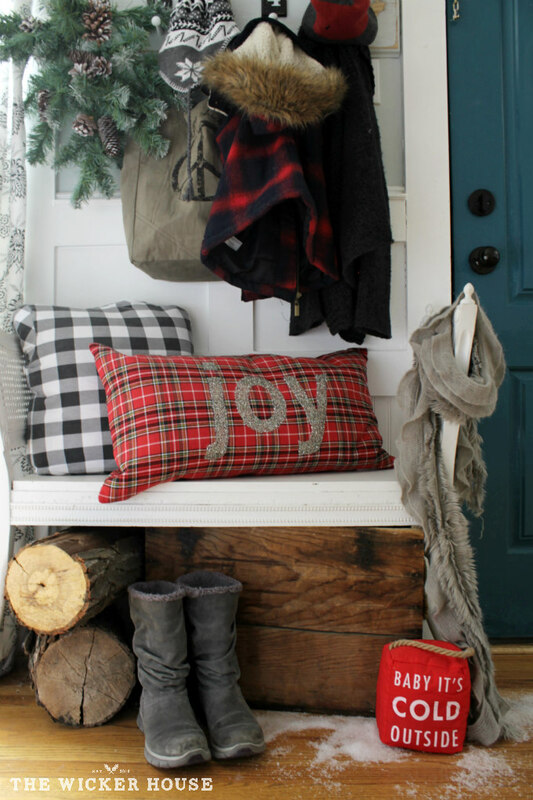 I'm loving all the black and red and plaid this year! And I love that you used my print!! (thanks for the shout out!). I think the pinecone star is my favorite element. So rustic and pretty. Love it all! I could gaze at these pics all day...I think I may have done that actually! I absolutely adore your home, Emily!! 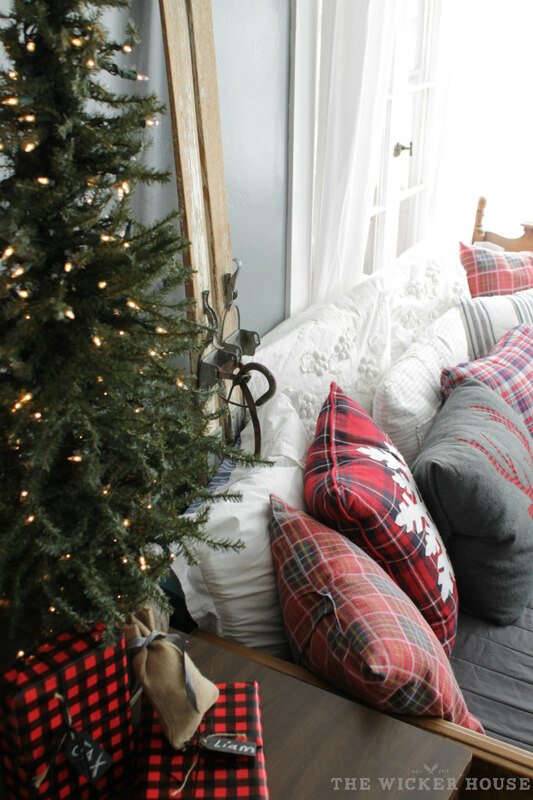 Every single thing is picture perfect and so cozy looking. Just gorgeous!! Absolutely gorgeous Emily!! 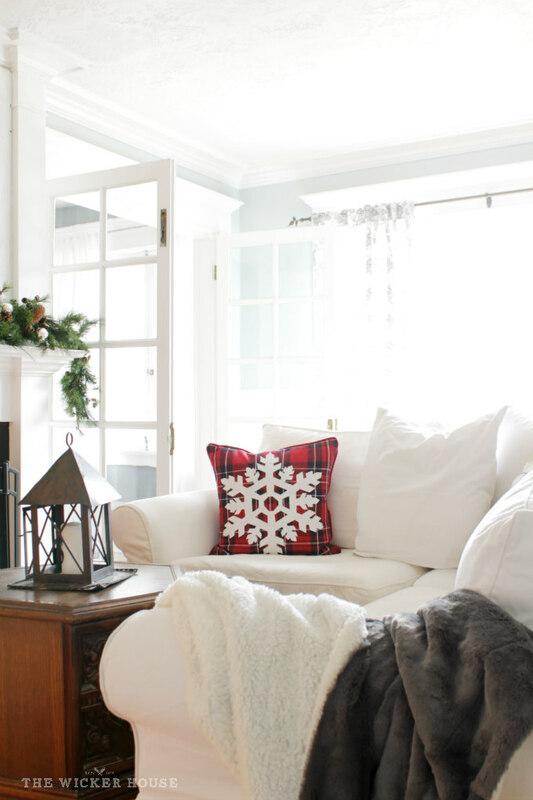 So cozy and warm and full of stunning Christmas details. I love the color combinations you used! Would you please share your paint colors?